This month, HUECU teamed up with the Brighton Public Schools, Harvard Ed Portal and Boston Private Industry Council (PIC) to host a personal finance workshop aimed to help local high school students Be Their Own Money Boss. 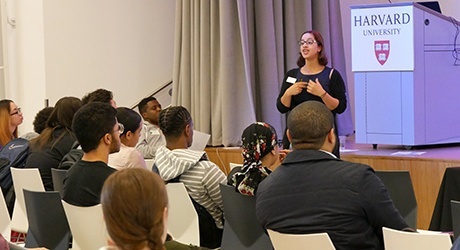 The workshop was open to all high school students who live or go to school in the Allston or Brighton communities and informed them about what they could do now to plan for financial success in the future. The workshop was led by HUECU’s Migdalia Gomez and was customized to what students wanted to learn. Topics ranged from budgeting to creating a savings plan, and receiving tips on the financial aid process and planning for college. Through interactive financial knowledge games and technology, students teamed up with fellow peers and learned valuable financial tips that they could use now to start them on a path to financial wellness. The Harvard Ed Portal is a collaborative partnership involving Harvard, the Allston-Brighton community and the City of Boston bringing educational, arts, wellness, workforce and economic development programs to the communities. For more information visit, edportal.harvard.edu. Boston Private Industry Council (PIC) is a nonprofit organization that strengthens Boston’s communities and its workforce by connecting youth and adults with education and employment opportunities. For more information visit, BostonPIC.org.